Yesterday marked the first day of Spring. Yay! This has been one of the worst winters I can recall in New York City but we managed to get through it. And even if the warmer weather isn't quite settling in yet, I feel better just knowing it's officially Spring. Here's to brighter days and balmier temperatures ahead! I can't wait for the cherry blossoms to bloom again. I'm having a Spring sale in my Etsy print shop! Take 25% off all orders with the code "HAPPYSPRING" through the end of March. I snapped this selca of myself after I trimmed my bangs the other day. They had gotten so long that they started blending into my bob. They're still on the long side but I didn't want to cut too much at first since I can always make them shorter which I might do. And I'm wearing and loving the Firmoo glasses I won recently in Alway With Yoo's giveaway. In other news, I'm back in physical therapy for my ankle. It's feeling alot better now and I'm trying to wean off wearing my ankle brace. As clunky and "fashionable" as it is, I actually got used to it and feel more secure walking around with it than without. So does anyone else cut their own bangs? I like the bangs, Rowena:) And here's to the arrival of spring indeed! What a brutal winter we've had, eh? Yay for Spring! And so glad to hear your ankle is better. Hope the physio therapy will make it 100%. I hope the weather improve and get warmer, glad you feeling better from your ankle sometime is good to do something for ourself and trim our hair. Enjoy your weekend doll. Glad to hear about your healing ankle. Great proverb. Happy weekend Rowena. wish you a wonderful spring-weekend sweety! Happy Spring! Although here in Delaware its still a little chilly ...I'm just happy to put the big coats away. Love spring fashion. Hope you have a wonderful weekend. yay to spring and cherry blossoms! i like your new glasses too! yay you got them :) and hope that ankle heals quickly. sending over some good energy! Yes it was long and cold, though certainly not the worst. I have lived through worse. In fact I lived through three in a row that were so bad I up and moved to Seattle! I forgot you had a print shop. Love the Stepping Pretty and Charmed life prints. Hello Spring! I love this season"
I love this image/layout and anything that addresses the real and then the positive! You are so cute! Love the bang trim shot! I love sweep bangs! Have a wonderful weekend! I'm glad to hear your ankle is better... happy spring my dear Rowena!!!! I love it. Beautiful. Happy spring. I hope winter finishes it's final curtain call soon. Yay for Spring! And a lovely quote as well. So funny, just today I was thinking about cutting my bangs, but I do think I need someone else to do it for me, I'm so bad at it. You look great with bangs, actually I think you would look amazing with straight bangs too! Hope your ankle gets better soon! Have a great weekend! wishing you some warm spring weather lovely. You look so cute in that pic! I always cut my own fringe, sometimes it goes a little skew but thats okay. It was great reading your comment...wishing you a wonderful and warm weekend! hope your ankle get better soon! :) have a great weekend rowena. keep in touch dearie! We had amazing winter here in the UK. Last winter was one of the worst ones here. I was ill pretty much all the time and the winter didn't go away until May!!! Have a great weekend! Spring better hurry up and get here!! I've never cut my own hair before, but mine is so fine that if I screwed up one section, it would be so noticeable! I can't wait for warmer weather! But seems like we'll be stuck with winds and low temps for a bit.. Hoping I have the time to catch the cherry blossoms this year :D Where do you usually go? Love the quote, here in my country is summer! Lovely new hair cut, Rowena! Great to hear that things are turning for the better, weather and what not, for you all over there. 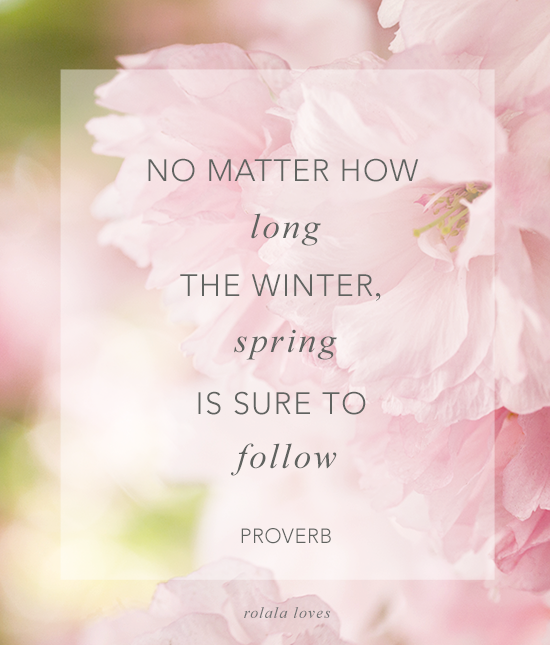 Hope you enjoy the spring days ahead as it warms up through time! Love that spring is finally here! I wish you a happy and sunny spring! Yes! Spring always comes around doesn't it? ~ love the selfie Rowena:) you are darling! Beautiful post! I am longing for Spring myself...hopefully the weather will catch up with the season and true Springtime will appear. Aye, it is indeed spring even though it realy does not feel it. Well, down in London it's starting to warm up, but up north, naaaah, there's still an icy feel outside. I'm just grateful we barely had any snow this winter, YAY! you did a great job with your bangs. i always hack mine off. hahaha don't give me a pair of scissors. happy spring to you rowena. happy weekend. I'm glad that Spring has officially arrived in NY. I'm curious. How do you know which is the official day of spring? Is it by the calendar date or by the snow clearing? This has always gotten me curious. We don't have the 4 seasons here so it is very interesting whenever I read all my overseas blog friends post about the weather and climate. It seems like Spring is arriving at many places already. I hope you would continue to stay warm and lovely. You should post more pictures of yourself or I would slowly grow to think that I'm talking to the Rena (as in your profile pic) Do keep the bangs as they would frame your face quite well. I adore ladies who wear the bangs as I can't stand them on myself. Look cute on you, Rowena. Hope your ankle is quickly healing. I am dying for sunny warm days. So tired of a long, cloudy winter. Such gorgeous photo of flower.